Issued September 24, 2002, to Nintendo Co. Ltd. The ‘652 patent details a video game system which permits game play involving three-dimensional images to have a depth and realism that exceeds previous known game systems. This video game feature, exemplified by Super Mario 64, features unique player controls which permits control over a character’s exploration of the three-dimensional world. 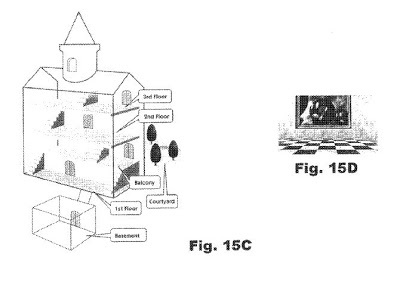 Before, when a level was completed, the player would be forced along the controlled path to the next object, but with this patent came the ability to continue to explore the worlds the player had completed in order to collect all stars, coins, etc. before moving on at his liking. In the case of Super Mario 64, whenever a player would go into a room in Bowser’s castle, he was free to jump through any portrait on the wall and explore any world he wanted, as many times as he wanted, in whatever order he wanted. It was a pretty novel idea for an ordinary plumber. A video game system includes a game cartridge which is pluggably attached to a main console having a main processor, a 3D graphics generating coprocessor, expandable main memory and player controllers. A multifunctional peripheral processing subsystem external to the game microprocessor and coprocessor is described which executes commands for handling player controller input/output to thereby lessen the processing burden on the graphics processing subsystem. The video game methodology involves game level organization features, camera perspective or point of view control features, and a wide array of animation and character control features. The system changes the “camera” angle (i.e., the displayed point of view in the three-dimensional world) automatically based upon various conditions and in response to actuation of a plurality of distinct controller keys/buttons/switches. 1. For use with a video game system console having a game program executing processing system to execute said video game program and at least one player controller operable by a player to generate video game control signals; a portable storage device for controlling the operation of said video game system console comprising: a memory medium for storing video game instructions and graphics data; accessing circuitry for coupling said video game instructions and said graphics data retrieved from said memory medium to said video game system console; said video game instructions including instructions for causing said video game executing processing system to generate digital representations of a plurality of different three dimensional courses within which a player controlled character may enter and achieve goals, and for generating a pause screen in response to a particular player input; wherein said pause screen includes an option for enabling the player to exit the course only if the pause screen was selected by the player when the player controlled character was not moving.